There is plenty to see and do around Brighton Pier, like walking along the beach, going on rides or stop at the shops, bars and places to eat. There arcade games are in the Palace of Fun and the Pleasuredome. The funfair has different rides like roller-coasters and dodgem cars. It also has trampolines. There are stalls selling all kinds of food like hotdogs, fish and chips, doughnuts and candy-floss. There is also a restaurant called Palm Court, this has menus in Braille available. Tables and chairs are not permanently fixed to the floor in the restaurant. Or, if you want to bring your own lunches there are lots of places to sit or you can hire a deckchair. This map shows you where the attractions are. There is level access on the Pier and the entrance. 3. Offshore Bar Horatio’s Bar has 2 beer gardens. There is also live music here every Saturday night which is free. The Offshore Bar is a karaoke bar. During the summer the pier is open between 9.00a.m. - 2.00a.m. every day. During the winter the pier is open between 10.00a.m. - 12.00a.m. every day. Brighton Pier is even open on Christmas Day. You dont need tickets to visit Brighton Pier. Getting on the pier is free, but the rides and games will cost you money, especially if you like a flutter! You can buy tokens to pay for the rides. Look at the travel section in this page for travel prices. Brighton Pier is easy to find, just find the sea! There are 4 accessible parking spaces for people with disabilities at the Sealife Centre (this is opposite the entrance to Brighton Pier). Also there is a car parking area at Madeira Drive, which you can use as a drop-off place if you are going by coach. If you want to travel by Coach, you need to travel from Victoria Coach Station to Poole Valley in Brighton. A day return ticket to Brighton costs about £5.00 with disability concession (you will need to bring ID) or about £10.00 without a concession. You can order your ticket by calling National Express on 08705 808080. Wheelchair users will need their own supporter, call 01214 238479 for information/access helpline. For those with hearing difficulties the Minicom line is 0121 455 0086. All National Express buses have a small unacessible toilet. The terminal in Brighton is very near Brighton Pier. You cant take the underground to Brighton. You need to catch a train from London Victoria Station (Southern Rail 0845 123 7770) or London Bridge Station (Thameslink 0800 247 1012), both stations are said to be accessible and have accessible toilets for wheelchair users. There are accessible trains running every hour, it's best to call to find out which trains are best for you. There is a train that has really good accessible toilets for wheelchair users. The toilet doorways are 930 mm wide and there is plenty of space to move around. 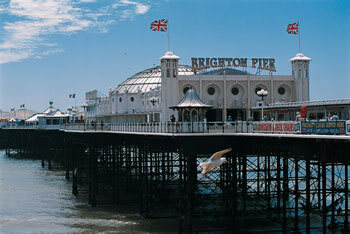 Brighton mainline station is about a 15 minute bus ride from Brighton Pier. Brighton mainline station is accessible for wheelchair users. There are taxis waiting outside Brighton Station all the time, some are black cabs. At Brighton Station there is an accessible toilet. It is kept locked, so ask a guard for the RADAR key or use your own if you have one. The minimum door width is 860 mm. There is also a baby change area. The way through the main entrance is very wide and flat. The pavement were in good condition on our visit. The braodwalks are very wide. The minimum doorway width is 850mm wide. The unisex toilets are fully accessible. It is mostly kept unlocked, the keys are kept at the nearby snack bar if you find it locked. The doorway is 850 mm wide. There is room for a wheelchair to move around in toilet. 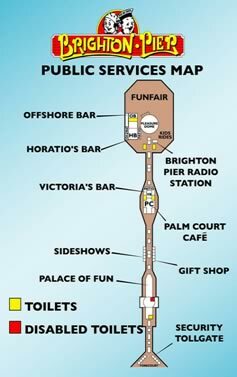 The toilets are all marked on the map of the Pier above.